Around a 100 people attended this event, which was based in Ludlow at the Bishop Mascall Centre which is close to the centre of the town in what was formerly the Junior School. 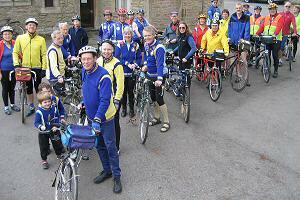 The Centre has comfortable accommodation for 48 people and the Tandem Club had sole occupancy. Those staying at the Centre were provided with a basic package consisting of a bed, a continental style breakfast, a packed lunch and a simple but substantial evening meal. Club members, not staying at the Centre, had access and were able to join in for breakfasts and evening meals. Ride routes were provided on each of the four days of Easter - Friday through to Monday with varying distance options ranging from 25 miles to 60 miles. 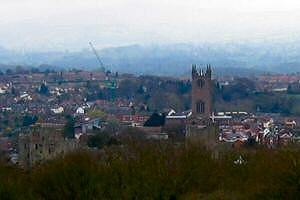 The weather throughout the weekend was predominantly quite cold but mostly dry and sunny.